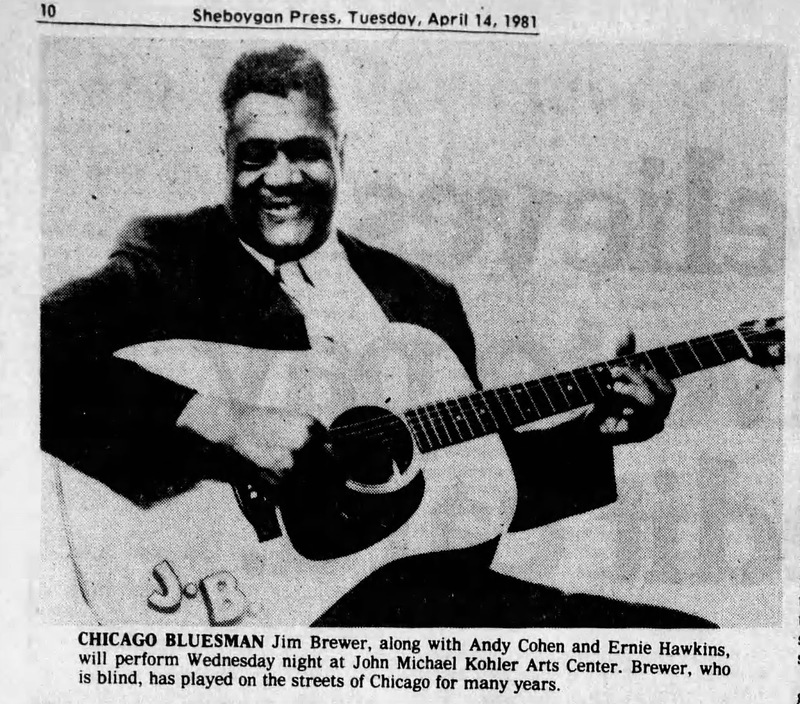 Work just don't seem to fit my hand"
For about 30 years, day after good day, Jim Brewer would plug his guitar into some store along Maxwell Street and play the sidewalk blues, where traffic plays backup. 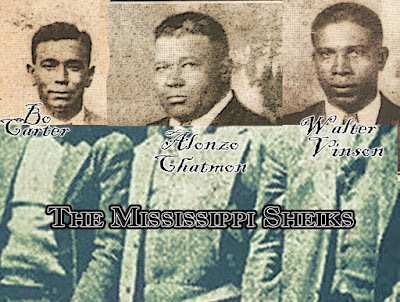 Black, blind, and eminently experienced at poverty, Brewer was born on a sharecropper's plantation in Brookhaven, Mississippi about 61 years ago. In his youth, despite his blindness, Brewer went on the road, playing and singing in churches, roadhouses, clubs, taverns and streets all over the South and Midwest. Eventually, he landed in East St. Louis and Chicago, where he made an esoteric reputation — but not much money — playing professionally on the streets. On April 15, 1981, he landed in Sheboygan for a performance at John Michael Kohler Arts Center. The show was organized by local musician and guitar-store owner Jim Ohlschmidt, of Ohlschmidt's Guitar Emporium. "He's a flat-out excellent guitar player. He's a brilliant practitioner of what he does. When I saw him for the first time, I told myself that if I could get this guy working, I was going to do it. He's been at it [for] so long, his manner on stage is very charming. He's not out there selling the show. He sits up there and plays the music…It's not frenetic, at all. He doesn't try to cram a whole lot of notes in, and the craftsmanship is elegant." Hawkins and Cohen, both white, acknowledge an arm's length distance from pop music and rock 'n' roll — the money-making musical mainstream. Brewer went on tour in the early 1970s and recorded an album, Jim Brewer, in 1974, on the Philo label. But he doesn't tour so much anymore. He gets a small stipend from the government because he is blind, Cohen said, and doesn't want to jeopardize it by taking in money away from home. 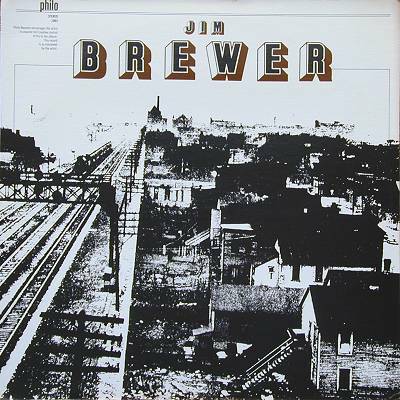 Brewer has played at the No Exit Cafe in Chicago, weekly, for about the last 16 years. Jim's repertoire is broad and stylistically varied. He knows folks songs, blues, play-party songs, country & western songs, religious songs and even a few Jimmie Rodgers numbers. Jim represents a cross section of the musical culture of several generations from Mississippi to Chicago. His talent has been smoothed and tempered by time and performance. He’s got a memory that songs and stories stick to and an imagination that generates more. Jim knows his job—entertaining people. In the time he has been singing professionally, he has sung to more than a million people. He can build and work a crowd as well as any patent medicine dealer. Jim has played music with lots of famous musicians, and many more who never got famous. Today, Jim is coming into his own. Here’s hoping that as be continues to grow, so will the respect that he has earned for himself and his music.